Modified Atmosphere Packaging for Fresh-cut Fruits and Vegetables provides comprehensive coverage of all aspects of modern MAP technologies for fresh-cut fruits and vegetables. Coverage begins with the general MAP concept and application by introducing the concept of MAP, how MAP works for fresh-cut produce and the benefits and shortfalls of MAP in its application. The book then discusses the basic aspects of MAP – packaging materials and machinery. In these sections, the book addresses not only the general information about MAP materials, but also supplies examples to introduce the new packaging films and their successful application in produce and fresh-cut fruits and vegetables. Unique chapters and sections in the book include relevant patents for MAP, commercial practices and MAP packaging machinery. Generally, packaging machinery is only included in books specifically covering packaging engineering. Coverage of this important aspect is included in the book since fresh-cut manufacturers spend much more time in the day-to-day operations on packaging machinery and systems as compared to packaging film materials. 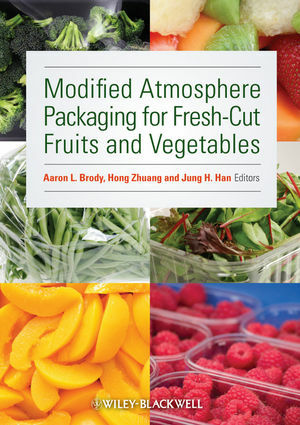 In the final section, Modified Atmosphere Packaging for Fresh-cut Fruits and Vegetables highlights the latest developments in the packaging industry and how they could impact the fresh-cut industry. Aaron L. Brody, Ph.D., is a consultant in food and food technology, packaging and marketing. He teaches undergraduate and graduate food packaging and food product development and marketing courses at The University of Georgia and MBA strategic marketing and product development courses at St. Joseph's University. His previous affiliations include General Foods; Raytheon Manufacturing Co., where he helped develop the first microwave ovens; Whirlpool Corporation, where he led the development of modified atmosphere; Mars, Inc.; Mead Packaging, where he managed the Crosscheck aseptic packaging system; and Container Corporation of America, where he was Marketing Development Manager. Dr. Brody is author of hundreds of articles and eight textbooks in food and food technology, marketing and packaging. He is contributing editor for Food Technology, and Technical and Marketing Information Editor for Brand Packaging. Among his awards and honors are election to the Packaging Hall of Fame; the Nicholas Appert award, Institute of Food Technologists' (IFT) highest award; IFT's Industrial Scientist award and Riester-Davis award for lifetime achievement in food packaging; Institute of Packaging Professionals' (IOPP) member of the year and honorary life member. Hong Zhuang, Ph.D., is a Research Food Technologist in the Quality and Safety Assessment Research Unit, at South Atlantic Area (SAA), Agriculture Research Service (ARS), USDA, Athens, Georgia. Dr. Zhuang received his B.S. in Plant Physiology from the Northwestern University in Xi'an, China, and M.S. in Plant Physiology and Biochemistry and Ph.D. in Nutritional Sciences Multidisciplinary, respectively, from the University of Kentucky, Lexington, KY. Dr. Zhuang had been working on research and development as senior research scientist and director of R&D in the fresh-cut industry for more than nine years before joining USDA research recently, and has experience in new product development, processing improvement, modified atmosphere packaging, retaining fresh-cut shelf-life, and new technology identification, evaluation and commercialization. Jung H. Han, Ph.D., is Senior Project Engineer at the World Wide Fruit and Vegetable Research Center, Frito-Lay Inc., Plano, TX. He received B.S. and M.S. degrees from Korea University, Seoul, Korea, and his Ph.D. degree from Purdue University. Dr. Han previously served as Associate Professor in the Department of Food Science and the Department of Pharmaceutical Science at the University of Manitoba, Canada. In the Food Science Department he worked on an antimicrobial packaging program and a biodegradable plastic program and taught Food Engineering Fundamentals, Food Packaging, and Total Quality Management. He is also an Associate Editor of the Journal of Food Science's Food Engineering and Physical Property sections. Dr. Han is an Editorial Board Member of Food Research International and Chair of the Packaging Division of the Canadian Institute of Food Science and Technology. Additionally, he is a past Chair of Food Packaging Division of IFT. Dr. Han has published two books – Innovations in Food Packaging and Packaging for Nonthermal Processing of Food.